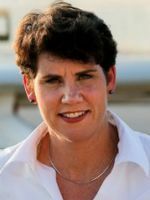 Info Amy McGrath was born the youngest of three children to Donald (a high school English teacher) and Marianne McGrath (a medical doctor and one of the first women to graduate from the University of Kentucky medical school in the 1960s). By age 12, Amy had fallen in love with military fighter jets. Wondering why there were no women flying, Amy discovered there was a federal law in the U.S. prohibiting women from serving in combat roles. Soon, Amy began writing to members of Congress and published letters to the editor in her hometown newspapers advocating for change to remove the restriction on women. After her own congressional delegation failed to respond in a satisfactory way (Amy never received a reply from U.S. Senator Mitch McConnell), she then wrote every member of the House and Senate Armed Services Committees. Many wrote her back, including Rep. Patricia Schroeder of Colorado, who said "The object of a war is to win. We should, therefore, field the best-qualified military possible...I think that it is time for military service to be based on qualifications, not gender." During her senior year at Notre Dame Academy in Park Hills, where Amy played three varsity sports, the combat exclusion law was lifted, following the election of President Bill Clinton, and she was accepted into the United States Naval Academy as part of the Class of 1997. She played varsity soccer for Navy all four years, graduated with a B.S. in Political Science, and was commissioned as a Second Lieutenant in the U.S. Marine Corps. After Marine Corps Officer Basic School, Amy completed flight school in July 1999 and reported to Marine Corps Air Station Miramar, San Diego, CA as an F/A-18D Hornet Weapons Systems Officer. 05/19/2020 KY US Senate - D Primary ?? ?